As Higher Education Institutions increasingly strive to find the most impactful way of conducting innovative education and research, many are initiating Living Labs programmes. The objective of a Living Lab programme is to establish a platform where people from different stakeholder groups can easily and effectively collaborate. While Living Labs are not limited to sustainability, this sector has led the way and embraced their potential to enhance learning and employability for students, problem-solving for campus managers, and deliver real-world sustainability improvements. 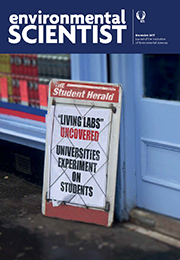 This issue of the environmental SCIENTIST explores the development of the concept, presents case studies from the perspective of a range of Living Labs stakeholders, and considers its potential to drive further change. To follow up from this edition of the journal, Filipa Ferraz introduces the Campus Community. Read the analysis piece here.